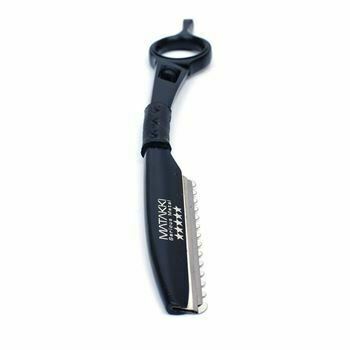 The Matakki Suraisu is our new professional precision instrument made for shaving, hairdressing, barbering, skin fades and hair tattoo design work. Manufactured with a soft touch rubberised straight handle and perfectly balanced for maximum control. Designed with a unique spring loaded system that ensures super quick and safe insertion and removal of blades, no more cut fingers. The Suraisu takes the Matakki MTR10 razor blades that are specially designed for our razor.